Variety is the word for this weekend's new releases, with a broad comedy sequel, a horror thriller and an early piece of Oscar bait making up the slate of new films. While it may not meet the standard of "something for everyone", it goes a long way towards filling out a group of films that has been dominated by giant franchises so far this summer. Leading off this group is Evan Almighty, a spin-off (with a better title) of the wildly popular Jim Carrey film from 2003, Bruce Almighty, which grossed $85 million over that year's Memorial Day Weekend. 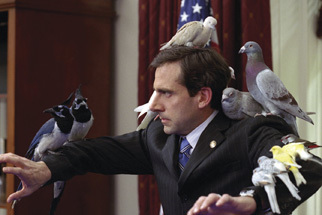 In that film, Steve Carell played a rival news anchor to Carrey, and a target of Carrey's temporary God-like powers. Stealing scenes from Hollywood's greatest scene-stealer, Carell started to get some notice beyond his then job as a Daily Show correspondent. One critically acclaimed and decently popular sitcom and one breakout summer comedy later, and he's a great big freaking comedy star. Evan Almighty catches up with Carell's character after he gets elected to Congress, where he is chosen as a new prophet of God (a returning Morgan Freeman), and told to build a Noah-style ark because of that impending flood. Yup, a flood any minute now... look, there's a cloud! Directed by Tom Shadyac, Evan Almighty has made news for a rather dubious honor, that of being the most expensive comedy ever produced, with a budget estimated somewhere upwards of $200 million. It's all the animals, you see, which were real, and not CGI. It's a giant risk for what is effectively a family-targeted comedy (the rating drops from PG-13 to PG), which seems ultimately light on laughs. It's a similar demo to the Santa Clause films, but without its seasonal tie-in. If any actor can pull off looking completely ridiculous and embarrassed and make it funny, it's Carell, and this film will be a huge test of his newly minted box office prowess. The cast also includes John Goodman and Lauren Graham, but let's face it – it's Steve's show to run here. I think both the previous film's tie-in and Carell's natural humor will be big factors in what this film ultimately makes, but the movie itself isn't doing it any favors. The ads mostly present panicky screams from Carell as the centerpiece of the comedy, with what appears to be a desperation move of practically giving away the ending in recent commercials. It's not a particular sign of confidence. Opening at a massive 3,602 venues, look for an opening weekend of around $35 million, which ought to top the weekend.